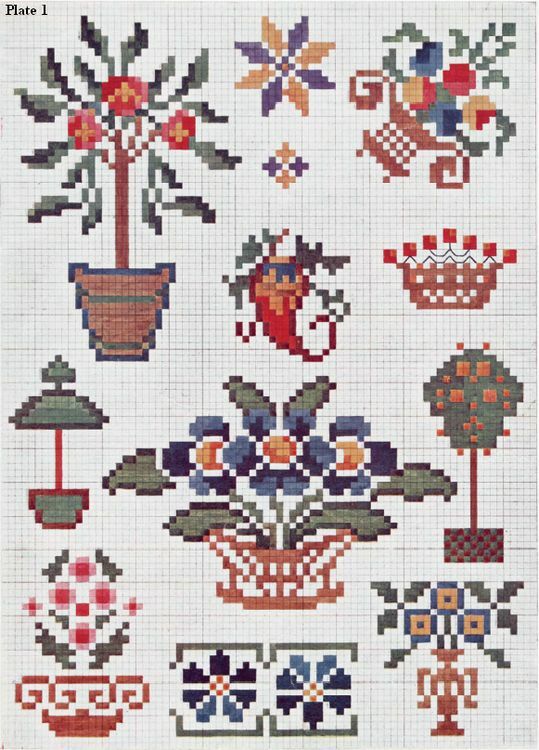 Editor’s Note: The following excerpt reproduces the suggestions and directions accompanying the full-color cross stitch plates in Priscilla Colored Cross Stitch Book No. 1, first published in 1912. Also see the General Cross Stitch Directions originally published at the beginning of this vintage cross stitch book and Priscilla Colored Cross Stitch Book No. 2, for more directions and two more full-color cross stitch plates. If a certain fabric has been selected for cross-stitch work, say Java canvas for a scarf, for instance, then a design suitable for a scarf and suitable in size for this particular material must be selected. The basket of blue and orange flowers in the middle of the opposite page is fifty-three spaces wide. By using two threads of the canvas for each stitch fifty-three spaces would measure seven and eight inches, and this would allow two baskets to fit nicely across the end of the scarf. If this same design were used on Mosaic canvas, it would occupy a space about twelve inches wide and would do nicely for a pillow top. If made on Hardanger cloth or fine scrim it would measure only about two inches and would make a pretty little pincushion or bag. This simply goes to show that the mesh of the canvas regulates the size of the design when worked. If it is desirable to make the design larger, there are two ways of accomplishing this, either take the stitches across two or three or more threads of the fabric, or make four crosses instead of the one shown on the pattern. Even nine crosses may be made for each one of the pattern, thus increasing the size of the design three times in both dimensions. Of course the size of thread used determines which is the better plan to follow. Before commencing any cross-stitch piece, count the number of spaces occupied by the design, the count the same number of spaces on the fabric and mark off exactly how large the pattern will be when worked. The rose tree at the top of the page is very pretty for the bottom portieres made of burlap, monk’s cloth, or some similar heavy fabric. This may be enlarged to any desired size by increasing the number of crosses, and a quite heavy thread is recommended for this particular purpose. To the right of the tree the little star and cross border appears, or at least, the two motifs are intended for a border to be made by repeating the spots at regular intervals. If a more solid effect is desired, place a straight continuous line of crosses on both sides of the motifs. This makes a pretty band for trimming children’s dresses and aprons and it is effective in one or two colors. At the upper right corner is a dainty basket of flowers made on the diagonal. This is a quaint, old-fashioned design which is delightfully pleasing on the corners of a tea-cloth and which may also be used on the napkins by taking smaller stitches. It is also suitable for ornamenting a square centerpiece, and is pretty on a bureau-scar and a square pincushion. The cornucopia, which represents or suggests “plenty,” is a suitable little spot for a napkin corner, or can be used as a border on the end of a sideboard-cover. the other baskets and trees on the page will find their proper uses either as repeating borders on towels, scarfs, and other household articles, or as separate motifs on bags, dainty little pincushions and handkerchief-cases. The blue and green flower border at the bottom of the page has numberless possibilities both in form adaptation and color schemes. It is dainty for a curtain border, pillow, dress trimming, and any other purpose for which a straight band can be used. It is even effective in a single color and is varied enough in form not to be at all tiresome. The simple alphabet at the top of the page is ten spaces high. It is most useful in marking linen, especially towels, sheets, and other bedroom linen, and on a fine weave fabric it might be used on baby things. The little forget-me-not makes it especially appropriate for this purpose, but if for any reason it is desirable to leave out the flowers, this may easily be done, continuing the letter in the plain color. Three initials across the end of a towel will be ornament enough, especially if they are flanked by one of the little ornaments given with the alphabet. The Greek border will prove a most popular design for narrow repeating bands for children’s dresses, towel ends, and a numberless other purposes. It may easily be increased in size by making four crosses in place of every one indicated on the diagram. It is also an easy pattern to work, as it is continuous and there is no breaking of threads nor skipping from space to space. Besides being a good design for cross-stitch embroidery, it is also excellent for filet work, either darned net or filet crochet. Many of the cross-stitch patterns are suitable for filet, in fact, any pattern which has sufficient character in the mere form and is not dependent upon the color scheme to bring out the design; any design which looks well in a single color in cross-stitch is appropriate for filet work. The big bunch of roses with scattering forget-me-nots is dependent for effectiveness upon its coloring, but other colors may be substituted for those illustrated. Brownish yellow roses would be most pleasing. This design is suitable for a hand-bag made of canvas, the entire background between and outside the flowers being closely filled with a plain dull color or black. The same design may be worked on a coarse canvas in crewels in the old-fashioned style, making a quaint pretty cover for a hassock or foot cushion. The background should be black and the knotted fringe on the edge mostly black, with a mere touch of the prevailing colors. Another adaptation of the design is to work it in beads for a bag, either sewing the beads to canvas or stringing them in their proper order and crocheting the bag in the usual way. 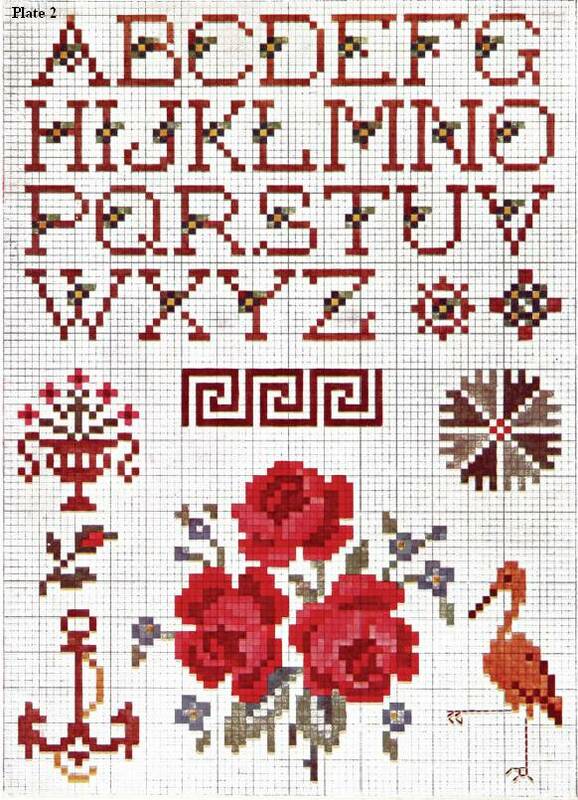 Any cross-stitch design may be used for bead-work, so these patterns really serve a double or treble purpose. The anchor is for a boy’s or girl’s sailor suit, to be used on the corners of the wide collar and on the shield, or simply on the left sleeve. Remember that cross-stitch can be worked on any fabric of any weave if a regular Penelope canvas is basted over the space to be ornamented and used as a guide. The dainty little rosebud repeated at regular intervals over a plain space makes a delightfully pleasing design for a baby’s pillow and carriage-cover; also it is dainty for pincushions, guest towels, and curtain borders. It may be used for an all-over design for a lagre pillow by marking off fourteen or fifteen mesh squares on the canvas, or whatever foundation is used, and placing a bud in each square, filling in the background with a plain color, and separating the squares with one or two rows of crosses in a bright color. The little figure above the crane is also appropriate for an all-over pattern or can be repeated in a line as a border. The crane makes a suitable motif for a pin-book or pincushion. 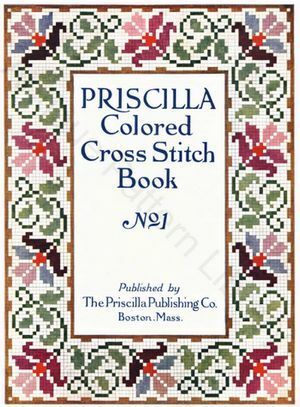 Priscilla Color Cross Stitch Book No. 2 for two more free, full-color cross stitch plates.